This is the final week in our food and home cooking month. We've been discussing food shopping, storage, stockpiling, menu planning, cooking from scratch, batch cooking and preserving. In this final week, we'll be talking about food fads, food waste and home cooking, surely the best food there is. There are fashions in foods as well as clothes. Recently some of the food fads have been kale, bone broth, any ‘new’ grain or seed such as quinoa, spelt or amaranth, kimchee and other ferments, and coconut oil. I’m sure there are others I’ve failed to notice. I’m not a follower of fashion. I think it cheats us. It makes us want something, then when we have it, it says we can’t like it any more. Throw out the old and buy this; it’s better. When you’ve been around as long as I have, you’ll realise that most things go in and out of fashion and you should just like what you like, regardless. If you think I don’t care for any of the food fads I’ve mentioned, think again, because I think they’re all great foods. I just don’t see them as something new. Like most of our ancestors, yours included, I’ve been using all of them for many years and will continue to, even when they’ve gone out of fashion again. If you could phone your great-grandma right now and ask her about food, she may not know what Big Macs, Pop-Tarts or yoghurt tubes are but she would know most of today's fad foods. She might know kimchee or sauerkraut as fermented cabbage, but she’d know what it is and how to make it. She would also use bone broths and probably dig the bone marrow from the end of the lamb leg when the roast was cooked. I know we did in our house. So be confident with your food choices and don’t be bullied into or out of liking something. The current estimate is that about 30 per cent of the food we buy is wasted. I think the main problems are buying too much, and a general lack of skill when it comes to selecting fresh food and storing it correctly at home. Luckily, these are skills anyone can learn. If food spoils before you’ve had a chance to eat it, it might be wise to rethink your food-buying and storage strategy. Plan your menus every week. There are many ways to menu plan so work out a system that suits you and stick with it. Use the vegetables and fruit in the fridge before you buy a new batch. Bring your shopping home as soon as you can. When you get home, put everything away immediately, starting with the cold products. Before putting dried goods such as flour and grains in your pantry or stockpile, place them in the freezer for two days to kill any larvae present. Use your freezer to prolong the life of food - milk freezes well, so do egg whites, egg yolks or whole eggs mixed together. Don't forget to date your freezer food. Add new products to the back of the stockpile and move older food to the front. Don’t store potatoes or onions in plastic bags as they’ll rot, particularly in hot and humid weather. Wrap celery in aluminium foil – it will keep well for six weeks, still crisp. Store most vegetables in air-tight plastic bags rather than just loose in the crisper. Use your leftovers and add a leftovers day to your menu plan, or use leftovers from the evening meal for lunch the following day. One of the great treasures you’ll develop during your years of cooking will be your recipe collection. Your family will grow up eating those recipes, and hopefully they’ll continue cooking the traditional family recipes when they have their choldren. You can start your collection with your childhood favourites and those you’ve collected over the years. I’ve written extra notes in a couple of my favourite cookbooks, and I hope my sons will treasure them, the food and the notes, when I’m no longer here. These cook books, and The Country Kitchen (not pictured), along with the recipes I have stored in Paprika and in my brain, form the basis of my home cooking. I sometimes add additional recipes to my favourite books. Both my sons are chefs and I know when I'm gone, they'll be using my cook books. It's a simple way of handing on family recipes to them. One thing is for sure: you’ll need some way of storing your recipes so they can build into a treasure trove. You can do that by buying a beautiful book with blank pages, use a box with cards or an exercise book, or you could do what I’ve been doing for a few years now – collect digital recipes in a recipe manager. The one I use is called Paprika. Once you’ve worked out how you’ll store your recipes, it’s just a matter of collecting them. Ask your parents, grandparents and siblings for family recipes, ask your friends for favourites you may have eaten at their homes, and spend some time browsing online or through magazines to find some you like the look of and want to try. When you have a new recipe to try, add it to your menu plan. If you enjoy cooking, you’ll never stop collecting and trying recipes. But make sure you’re organised from the start – set yourself up for success from day one and don’t create a mess of clippings and notes that you’ll hide in a drawer and never use. The best way to add flavour to meat is to caramelise it. Many foods have natural sugars in them. When you cook meat on high heat it turns brown. That is caramelisation and it intensifies flavour by removing water from the meat's sugars. You should add a small amount of oil to the surface of the meat or to the pan - I always use olive oil - heat the oil so it's quite hot and add the meat. Don't add too much meat at a time, if you have a large amount to cook, add it in batches and brown the meat a bit at a time. That allows the meat to caramelise. If you add too much meat at once, the juices in the meat will release and it will stew instead of dry fry. Once you've browned all the meat, you can carry on with your cooking, knowing that you've added much more natural flavour than you would have had if you'd just cooked the meat in a sauce. Spices are the flowers, bark, roots, berries or seeds of various plants used to develop flavour in cooking. They are usually dried to a powdered form and added in small amounts. When you add spice to your cooking, you will release more flavour if you dry fry them in a pan before use. When you buy spice, only buy small amounts as they lose flavour when stored for a long time. Store your spice in a cool dark place in a sealed jar. Spices are often used in long slow cooking - such as curry, or sprinkled on the top of food to add a quick burst of flavour, such as pepper. Other spices include chilli powder, cardamon, coriander seeds, paprika, and many many more. Herbs are similar to spices but they're usually fresh. Herbs are parsley, chives, sage, oregano, thyme and fresh coriander leaves. When you add herbs to a recipe, you can add them at the beginning of a slow cook, and that will add flavour while cooking, but you can also add them at the end to add freshness to the dish. For instance, you might add garlic, parsley, oregano and thyme to a spaghetti sauce recipe - cook it for an hour, then add more parsley at the end so the meal is served with green parsley to give it a fresh taste. A wide variety of salts are a big part of home cooking. It's used to season food and also to draw liquid out of food. Adding a pinch of salt to otherwise sweet food enhances the flavours you use in cakes, biscuits, bread etc. Sugar or honey can be added in very small amounts to bring out the flavour in certain foods. For instance, half a teaspoon of sugar in a tomato dish - such as pasta sauce, will make the tomato flavour more intense. A small amount (½ teaspoon) of sugar added to slow frying onions will help them caramelise. Add flavour by allowing water in the food to evaporate. Do that by simmering with the lid off the pot and it will concentrate flavour in the dish. You can add flavour to raw foods by dressing them. 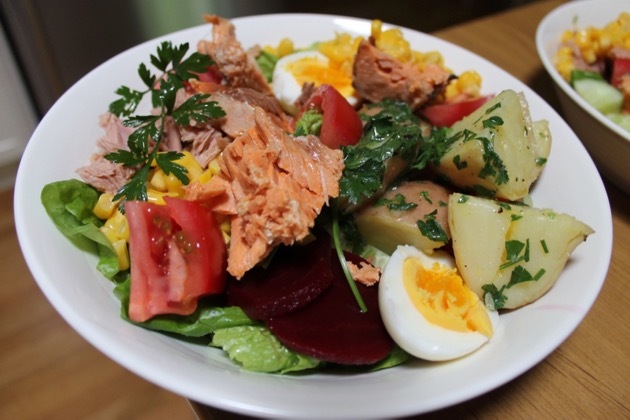 Salads are usually raw vegetables and fruits combined in various ways. Add flavour and bring a mix of raw vegetables together by making a simple dressing. A general all purpose stock can be made whenever you have meat bones or spare vegetables. You can cook the bones with the vegetables in water and that will make stock. However, if you roast the bones and vegetables in the oven for an hour, you'll caramelise the flavours and make tastier stock. To make stock, roast bones/vegetables for an hour, then add to a stockpot and cover with water. Add bay leaves, pepper, a chopped onion, two sticks chopped celery and a chopped carrot. Bring to the boil, skim the scum from the top of the liquid and simmer for an hour with the lid on. When it's cold, it can be frozen or stored in the fridge for up to a week. 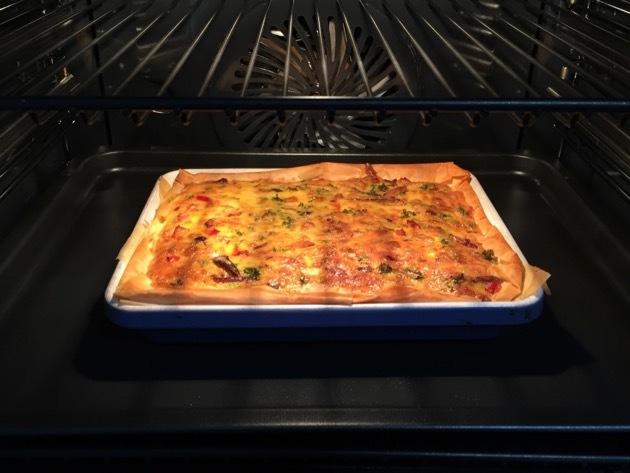 Simple quiche with bacon and parsley, made with store bought filo pastry - in the making (above) and in the oven (below). As you can see, all these techniques involve good wholesome food, with no artificial flavours. Home cooking relies of developing natural flavours and that is done using the techniques above or by adding natural flavour like spice or herbs. Don't be afraid to experiment. Once you've mastered that skill, you're on your way to being a good home cook. I don't have much to add, except to say don't let the old recipes disappear. I always remembered both my grandmothers as excellent home cooks. Unfortunately , many of their recipes have disappeared since they died. Some of the aunts on my mom's side have a few, but on my dad's side they are not to be found. When I retired, I organized as many family recipes as I could find, mine included and typed up a family cookbook. I had copies printed for my children, all my siblings and my husbands family as well. Many of the recipes were from his mom, now deceased. Find a way to pass them on, it will be appreciated. Excellent post and beautiful pictures. I am in complete agreement about the food fads but here in the USA there are food phobias too and that can be hard to deal with when people eat this but not that and it changes next week. We just go on the way we have always been and ignore that whole thing. We eat wholesome simple foods day in and day out and leave all that to the masses. My daughter in law paid me a huge compliment when she said that I have the best recipe collection. It takes years to find the best recipe and make the changes so that they are to your family's taste but it worth the time to do it. Once you have the recipes it is just a matter of cooking them and that is the easy part. We have no set day to go to the grocery here. We go when we are out of produce and usually the other perishables need replenishing at the same time. It is amazing how your produce drawer can look bare but there are still a day or two of meals there. If I don't use those items up then the new tends to be used once it comes in the door and that creates waste. I am surprised most weeks by how little I actually need to purchase when I plan from the menus. If I go on down to the store and just buy what looks good in the produce department then it will most assuredly go to the compost heap. I gave both my children a big notebook for Christmas, and they are now putting copies (either handwritten or photocopied) of their favourite family recipes inside. I love that they are building cookbooks based on their own tastes, but from recipes that we've enjoyed as a family - to take a bit of home out into the wide world with them one day. I would only add that vegetables in their proper season taste far better, so it makes sense to enjoy them lavishly while they're at their best, and freeze them for when you can't get them locally any more. Beans that have travelled 10kms when they're at their peak taste better than beans that have travelled from Kenya or Mexico out of season. Develop seasonal recipes and perhaps, as my mother did, keep a recipe book divided by the seasons so you come to learn what is good and when. I love these food posts! It always inspires me to cook more like my Nana, though we do eat fairly basic meals. There is nothing wrong with some rissoles and vegetables! One tip I would like to add is to label everything that goes into the freezer. I use a roll of masking tape and a sharpie pen. I rip off a small amount of tape and fold one end under itself so the tape is easy to remove from the container. I note down the date, what the item is and the quantity (i.e. 26/03/18 - Chicken Thighs x2). So many times I have frozen something and thought "I'll remember what this is..." or I have defrosted meat and it wasn't what I thought it was! I'm loving your posts. I never cooked as a child (I've since starting teaching my own children) and we mostly always cook from 'scratch'. I have coeliac disesase so I have to cook all my food to be safe and not waste time reading ingredients on the back of packs. However, I do only have a limited reportoire as I'm forever searching up simple things such as, what you mention above, a simple salad dressing. I must admit I do get tired of searching the simple things. My mum used to make a beautiful dressing but she can't remember the full ingredients. I know it had lemon, garlic but she is 82 and she often remarks how she never wrote anything down as she always thought she would remember. Probably just lemon, crushed garlic and olive oil. Try double lemon juice to olive oil and add salt and pepper to taste. thank you for another great post. I have most of the cookbooks you have in your photo and also The Country Kitchen. 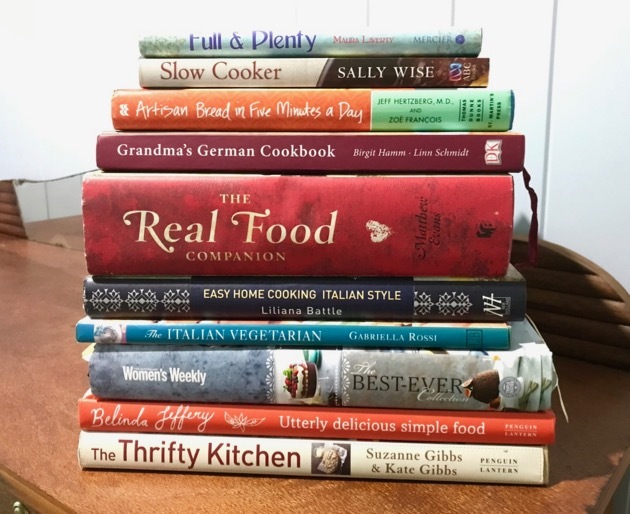 I use these cookbooks for a lot of my cooking because the recipes are for tasty and simple dishes suitable for everyday family meals and also special occasions. They don't reqire expensive, hard to find ingredients or equipment and can be made without using time consuming and complicated cooking techniques. 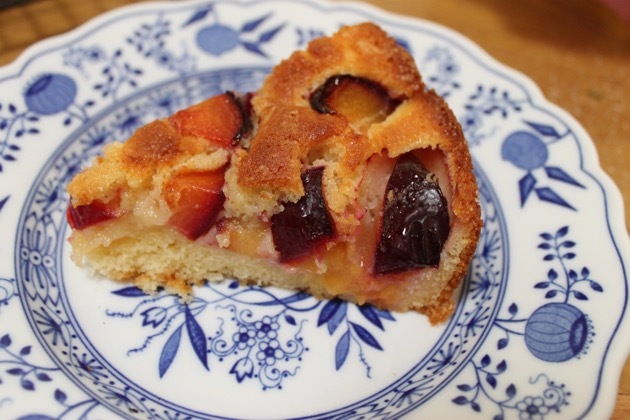 I have done a search on your blog for the delicious looking plum cake but can't find it. I would love the recipe if you are able to provide it please Rhonda. There are some lovely plums in my fridge waiting to be made into something special. Thank you for your great blog. Like many of your readers, I truly appreciate all the time and effort you put into it. Hi Maria, the cake is just a simple butter cake with plums added. I have the recipe here: https://down---to---earth.blogspot.com.au/2015/04/time-to-get-serious-again.html I hope you enjoy it. I home cooked for many years for my family and then worked as a station cook looking after up to 22 people and now I am retired and living by myself I find it hard to accommodate just me, cooking for one is the hardest cooking I have ever done. Once I never had waste and cooked three meals a day now I only cook one time a day and am even considering making that the middle of the day, I wish I lived closer to a good size town and could shop daily for my needs like the French do. However I am determined to adjust and relearn, I have 22 meals that I like now I have to change the way I do them so they suit just me.Oh i also do not have a microwave so that complicates reheating things that make 4 serves as most recipes do.I wish it were possible to connect with others in the same situation and see what they do. You are right, it is difficult to reheat without a microwave but entirely possible to do without. It does require planning cooking on one's own. 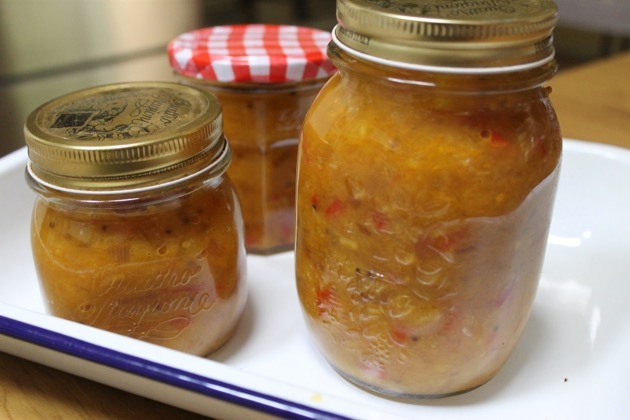 Freezing portions and making preserves seems to be the best way to keep the money under control and have a few simple cheap recipes you make regularly even if it's sometimes an egg on toast. You could defrost things in the container in a bath of hot water. Take the meal out and heat up in a steamer, stove pot or in the oven. One question I have is what did you do with the marrow from the lamb roast? I'm guessing adding it to soups/stocks etc? Can you freeze it for later? Oh I meant to tell you that when I was in the little local library in tiny town New Zealand I was delighted to spot your book The Simple Home! Unprocessed food and simple tasty recipes are what I usually cook in our home. The basics of food and cooking don’t really change it’s just the media that highlights a so called “new” food or method. Menu planning not only saves food waste but money and time. As I work fulltime, I find it is an essential part of the week. Makes life easier and gives us something to eat each night. Excellent tips as per usual. Considering how busy I am I am proud of the meals I make for the family. Amazing! I learned a few new things! I wonder what you do with cilantro. I place ours in the refrigerator but it goes bad very fast. We live far from a grocery store so we can't get to the grocery store all that often just for cilantro. Hello Angela, I wash, dry and chop it then freeze it in small portions. This is only suitable if you are going to include it in a dish that will be cooked ie Thai chicken patties or a curry. It isn't suitable to use as a fresh ingredient as its texture and colour changes after being frozen. I find coriander (as we refer to here in Australia) very perishable. The only solution that I have come up with for fresh coriander is to grow it but I need to sow seeds every few months as it tends to go to seed quite quickly. I believe there is a variety of perennial coriander,( Mexican Coriander or Culantro)that provides a continual supply. As yet I haven't tried growing it. Regards, Maria (from Adelaide SA). I snip the ends and place it in a jar of water in the fridge. It keeps much longer. Freezing it is a great idea or you could dry it to preserve it. All great advice! I am doing really well when it comes to food waste - I check the fridge daily, use up all the bits & pieces that I can and freeze what I can't use immediately. I'm also going longer between trips to the grocery store which is making a huge difference to my wallet. I'm also doing better at using up pantry items - I'd been letting things pile up so I'm now trying to alternate between fresh or frozen items and things from the pantry. I have some money come due in just over a month so I'd like to replenish items then - at least for 6 months ahead. You've just reminded me that I have a boxful of my mom's recipes that I've been meaning to go through. Just lots of bits & pieces of paper and memo cards - I'm going to reprint them and make up a new binder. They deserve to be kept in a better state than they are at the moment. I hope I didn't miss it. But I like to do one take a week called "Thursday special" or any day of week. Is to clean out left overs in fridge. Almost a free meal. The stats on food waste are so staggering. I think meal planning and having one person 'on top of' the food and what's in the fridge/freezer has helped us. Anything that looks like not getting used up in time gets popped in the freezer to avoid waste. I remember reading your tip on celery years ago and it was a game changer - no more limp and soft celery around here. 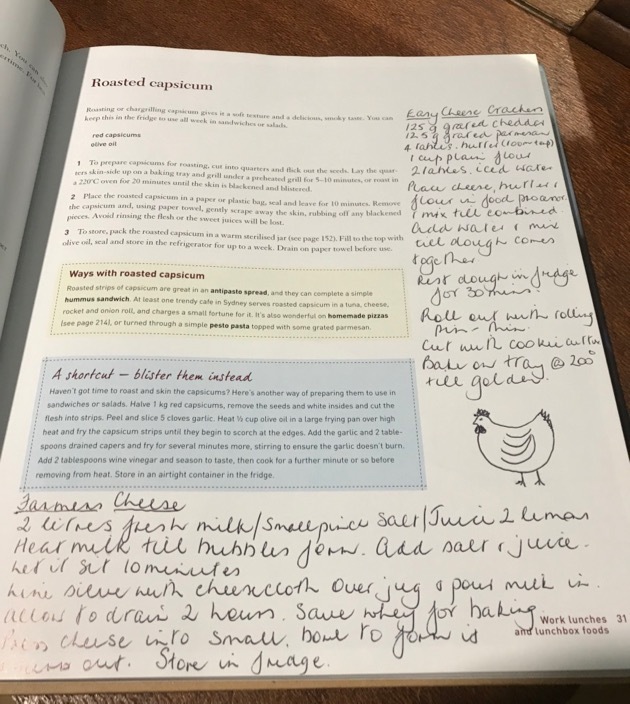 I loved your idea of writing family recipes in existing cookbooks - a great simple way to pass on the recipes without tiny bits of paper floating about. Thanks Rhonda, have a lovely week. We have started to make sure that we use up all our left overs by remaking into a new dish. 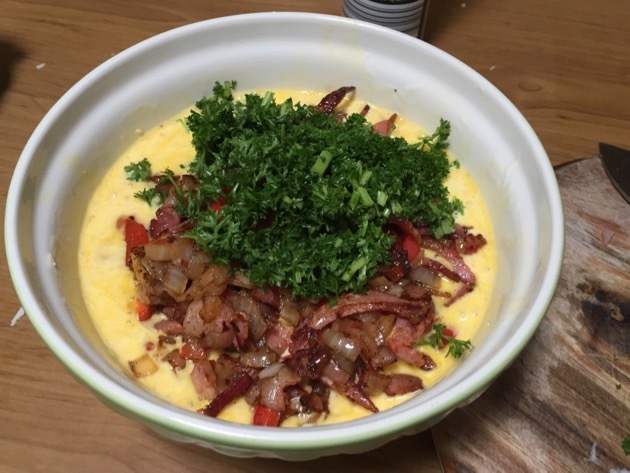 We often have leftover frittata. All left over veg goes into these. They taste delicious either hot or cold. We will often have fridge soup. This is all the veg that is getting past its used by date put into the slow cooker with some water or stock if we have any. I freeze these into single portions for days when I just want soup and toast for lunch. Any extra recipes that I find and use, I write up on memo cards. These fit perfectly into photo albums which keep the recipe card nice and clean. I use folder tabs to mark off sections in the album to make finding recipes so much easier. Thank you for your wonderful advice Rhonda! I now do menu planning without fail on either Sunday night or Monday morning before shopping. First I check what veggies are in the fridge, then what is low re drygoods and cans. Then I plan a menu that has either beef, lamb, chicken, pork, fish or vegetarian as a base for 6 nights a week....I try to also choose recipes that have grains and pulses in them as well. They can be anything from stir fries to curries to casseroles and pasta dishes, so that we end up with a variety. As there are only 3 of us at home now, I freeze the 4th serve of recipes and this means we can choose one we each like for Sunday night....you'd be surprised what a variety there is that builds up! My youngest son asks for a copy of anything he wants, this goes straight into "his"folder. I have school-type folders for fish, chicken, pork, beef/veal, pasta, vegetarian/salads etc with clear inserts, so recipes can be tried and kept/discarded. One of the most marvellous things about old recipes is how economical they are. Without the huge range of ingredients we have access to, cooking was much simpler. If we could bring ourselves to cook simple, we would all be so much better off. By simpler I mean things such as a vegetable and lentil soup once a week to clean out the crisper before shopping day. Also, in the war on waste the internet is our friend in finding out ways to cook unused parts of vegies like broccoli and silverbeet stems, and celery leaves..
Back to the old recipes - if there is a recipe I love but find expensive to make, I look on-line or through my old recipe books for substitutes. For instance, once upon a time I made chocolate brownies with a Nigella recipe using actual chocolate and lashings of butter. Now I have wised up and use a recipe which contains cocoa powder and less than half the butter and sugar for a much healthier, more economical treat. Some of my most useful recipes are those which use up left-overs - recipes that use egg-whites, or the crumbs at the bottom of the Weetbix packet, and one of the most useful ways to organise recipes I have found, is by the main ingredient, so I know where to turn if I have a glut in the garden or a particular left-over to use up. I love these discussions on how we think about food, because using every little bit is a way to honour the food, the growers, the planet..
Good information,Rhonda. I’m learning how to develop flavors and not running to the cupboard for a packet of something to add flavor to dishes. I’m redoing and rethinking how I’ve cooked all my life, going back to basic good home cooked meals. Learning how to make things from scratch. Making bread and desserts for dinner. I have my first kimchi soaking in salt water right now. Making cordials and switchel to drink instead of sodas. As I’m going through my day caring for my home and family little things that you have written pops into my head. It makes me slow down and take stock and pride in what I’m doing. Thank you for taking all the time you do in teaching us all how to fluff our nests. If 30% of purchased food is wasted, then someone is wasting a lot of extra food on my behalf! I never waste anything I buy. It all gets eaten. A farmer or someone put a lot of effort into producing that food & if I waste it then I am disrespecting that person or food animal & their craft or skill. On the rare occasion I might have to throw out the last scrapping in the sour cream container because I am dieting, therefore eating less of said product. I agonize over where to put it because I am 'wasting' some product. Do I just rinse the old container under the tap & put that container in the recycle bin? In which case the bit of sour cream goes down the grey water into the septic tank. Or do I scrape it thoroughly into the compost bucket so it is recycled into garden food? I never even throw the dark green lettuce leaves into the compost bin. If I grow the lettuce I pull those leaves off the plant while they are still good & make lettuce rolls from them for lunch. Then the remaining lettuce is picked a few days later & all leaves can be eaten. I give them a light wash, layer the leaves with paper towel, roll up & store in a plastic bag or container in the fridge. That way the lettuce keeps at least a week, often more. Any left over cooked food goes into a labelled recycled take-away container & into the freezer for a time when I am too worn out from working on my property to bother cooking. I was educated at a very young age about the value of money & we often had none & for that matter very little bought food, certainly none to waste. My Mother taught me to cook simple food by the time I was 5yo & by 12 I could cook anything. She could not afford to buy more than we ate in a week. By the end of the week the fridge was bare except for the weekend food, usually already prepared. Simple salad was added from the garden & we had good nutritious food for every meal. On Monday evening she sat down & wrote a shopping list for Tuesday. It was a long drive to town over bad dirt roads so she took an esky. My Mother would pick me up from high school on that day so we went grocery shopping together. I quickly had to learn what isle to find which food item in the brand new supermarket that just opened when I turned 12. It was a new phenomenon, replacing the corner store. Then I did my home work in the car during the 60min drive home. What a fabulous write up today. I must read that again. BTW, we were at the royal Easter Show in Sydney this weekend and whilst the girls were reliving their youth on the death-defying rides, Mignonne and I attended a facilitated discussion on food waste in the arts and crafts pavilion. It was headed up by Costa Georgiadis - truly eye opening. I recently finished your book 'Down to Earth' and relished it. I have always loved cooking, even when I am only cooking for myself. It's my way to relax on a weekend. Making nutritious and interesting meals with what you have is a fun challenge, that includes pickles and ferments made from veges left over, and using left overs in another meal. Having basic ingredients like spices, herbs, flour etc on hand make this easier. But I've been inspired by you to stockpile more items like tinned fish and tomatoes, nuts and even dark chocolate. That way I can make a batch of choc chip nut biscuits in a flash, and even a quick pasta sauce if necessary. Thanks for keeping us working through the book! When my children (and some of their friends) left home, we went through my recipes to gather which ones they wanted a copy of. One of his friends whom was given one of these little recipe bundles attributes coming to our house and being allowed to cook with my son (as he wasn't at home) as a reason he became a chef. All my children were taught how to cook before they left home. My son is quite popular at university for his home cooking. When he was preparing to go to uni, he requested copies of some of his favourite cookbooks, a slow cooker, and a bread maker. He is appalled by the fast food his peers subsist on. But he also says a lot of them don't know how to cook or 'can't be bothered'. I think that is really sad. To stop waste in our home, I use a white board marker on the front of my fridge listing all left-overs and items needed to be used. The marker is easily wiped off our fridge and things rarely ever go to waste. Whenever there is something that gets on its last legs, I will make SURE to use it. Fruits become crumbles, compotes or smoothies; limp veg becomes stews, shepherd's pie, soups, stir fries, pasta sauce; dairy becomes sauces or baked goods; meats are cooked for the main meal, freezing any left-overs that can't or won't be used the next day; bread gets made into breadcrumbs or croutons, baked goods get frozen for another time. If I can't use up something before it goes off, I throw it into the freezer to be added to dishes above at a later date. I regularly go through my cupboard and cook with what needs to be used. Part of my food planning includes the leftovers from the bigger “starter” meals. The roasted chicken dinner becomes a salad with meat bits, and eventually a bean/chicken/ little spicy sausage/veg soup. I love that kale is a fad food, when our winter garden produces lots of kale, I have plenty of recipes to experiment with. When I brown meat like beef before adding to a casserole I toss it in flour first- this helps to thicken the final dish and with the caramelisation it really improves the dish. I give new brides ( and grooms) an attractive recipe file into which I have added some of our family favourites and specialities. I write by hand because I think its more personal and add recipes from my grandmother, mother, MIL and myself and the recipients are always touched by the thought and have a file ready to build up as they go through married life. Years ago, when my first child left home, I typed up all my family recipes, which included my mother's, into a word document and made, "The Mummy's Cookbook". It included tips and hints about substitutions, butter vs margarine, chocolate vs compound etc, cleaning tips, sewing tips, just tips in general. Things that we know and take for granted. When I finished it, I printed it out and put it into a folder book and gave it to my son. He was delighted and still uses it to this day. When my other 2 children left home, they both stuck their hands out for their copies. So, they all have one and use it regularly. I am very pleased that they will have the family recipes to carry forward. I still have the document on my computer and update it occasionally with new recipes or ideas. A friend of mine, who really is a bit of clutz in the kitchen, also asked for a copy when she saw one of kid's. She loves it and uses it also. So my advice is, if you have family favourite recipes or hints, put them down in writing and share them with your family and friends. This will ensure their continuance. Oh I love the little notes you leave in your cook books for your boys. What a beautiful idea. My grandmother used to make a lovely cinnamon cake. I got the recipe and put it in my handwritten recipe book that I was given when I was around 8yo. I wrote all the family favourite Meals and desserts in there over the years and continued to use the book well into my adult years. Unfortunately it was one of the many treasured items lost in my house fire. I have never been able to find a cinnamon cake recipe that was like Grandma's nor our familys favourite dessert which (funnily enough I have just realised also contains cinnamon) which was cinnamon apricot layer cake. And my memory of ingredients and their quantities would not allow me to attempt to recreate them. Sad face emoji. I keep a well stocked pantry and separate freezer. I also have a well stocked stash in my storeroom. And I'm currently trying to eat my way through what's in the freezer and fridge before I go shopping again. Little waste at my house with the chooks who like to try most things. Claire, that is so sad. What a legacy you had in that book. My Mom made sour cream cookies when I was a child and that recipe is long lost, too. I am so bad about food waste and want this to change. I sometimes forget, and are thankful for blogs like yours to remind me, that it is my JOB as a homemaker to do the best I can to reduce waste and make the most of what I DO have. I have some of my mom's recipes that are carefully printed in her handwriting. She also made a beautiful book with newspaper clippings and recipe cards. She loved to cook and take care of the home. I'm sure your sons and grandsons will continue to cook and bake all of the delicious meals you have shared. A wonderful legacy. I makw bone broth in the slow cooker. I just put 2 chicken carcuses in with enough water to nearly cover, peper corns and what ever vegies i have laying around. Then leave for 12hrs. If it turns to jelly when cooled you know its a good bone broth. I really shouldn't read your posts when I am hungry! Everything you cook looks so delicious! I have a hard time limiting the recipes i keep. I have a box with cards (and some very messy cards in there!) then I have a lovely little book that a friend gave me that I started to write out my favorites. then I also have some on a program called evernote. I like the look of paprika but do I really want to start out again on something new? Mostly I just love recipes - collecting them, filing them, and using them! I dont think I will ever change. I have 2 dog eared recipe books from my late mum with lots of her scribbles all over them. The books are great but the scribbles are precious. Thank you, so helpful! Love your blog. Many of us did not learn this when we were younger, so we are learning this now! Great post! I love this series, you've covered so much information already. 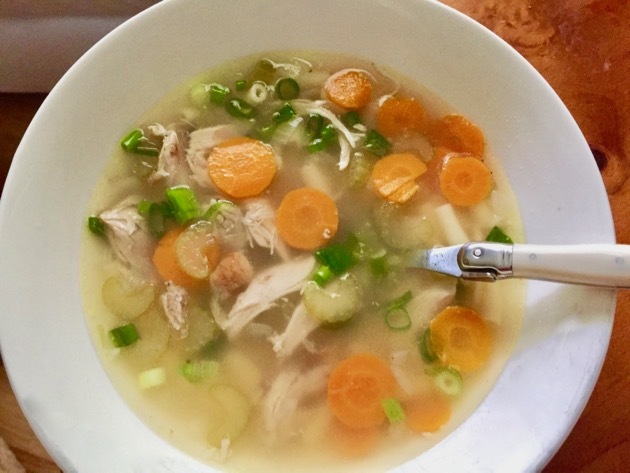 I found that once I started making my own stock and using herbs from my garden I was able to add so much flavour to home cooked food I no longer wanted to buy processed foods. Food choices - what and from where?